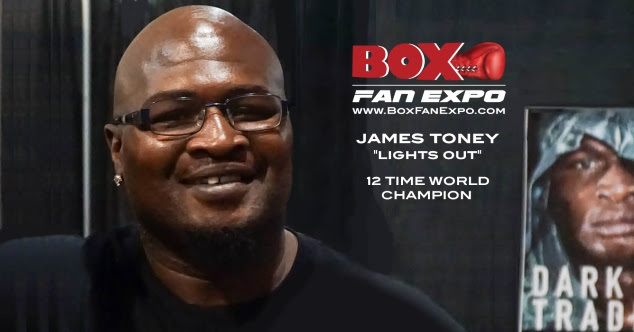 12-Time world champion James Toney has confirmed that that he will appear and hold a Meet & Greet with his fans at the Las Vegas Convention Center for the fifth Annual Box Fan Expo on Saturday May 4, 2019 from 10am to 5pm, during Cinco De Mayo weekend. Toney will make his 4th appearance at this years’ Expo, at the Hannibal Boxing Media booth and will be signing gloves, photos, personal items and book copies of Dark Trade, where he is featured on the cover.Fans will also have an opportunity to take pictures with this boxing legend also known as “Lights Out”. Hannibal Boxing Media produces the finest boxing books available and is a fast-rising source for first-rate boxing journalism. Hannibal Boxing’s book publishing imprint is Hamilcar Publications. Recent and upcoming book releases include Off The Ropes: The Ron Lyle Story, Dark Trade: Lost in Boxing, and Jacobs Beach: The Mob, The Garden & The Golden Age of Boxing. At the Box Fan Expo this year, James Toney will be signing copies of this new 1st U.S. edition of Dark Trade, where he is featured on the cover. Also at the Boxing Expo, Hall of Fame Broadcaster Al Bernstein will be signing copies of Off The Ropes, where he contributed a foreword as a moving tribute to Ron Lyle. Learn more about Hannibal Boxing and Hamilcar Publications at www.hannibalboxing.com.